This guest post by Michelle is in honor of Shavuot (Pentecost), the Jewish holiday observed next week when it’s traditional to serve dairy. 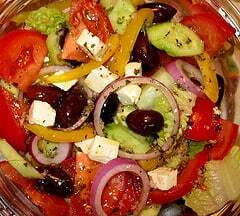 Greek salad, or horiatiki, is a rough country salad of juicy tomatoes, crisp cucumber, sliced red onion, pepper, crumbly feta cheese and plump kalamata olives. Serve this delightful combination as a side dish or as a light meal with some crusty bread. Place the salad ingredients in a large bowl. POUR the dressing over the salad and toss gently to combine just before serving. Garnish with a little freshly ground black pepper. One of my favorite summer salads. that photo is making me very hungry! I always say “I don’t have the salad dressing gene”, but no more thanks to this recipe, which has become my STAPLE. I love it and make it by the pint. THANK YOU. Tanya, glad you are enjoying it. Your salad photo looks fantastic. Greek salad is a must when I make a grill party.